What a year 2018 has been! We are looking forward to 2019 with great anticipation. Thank you to all who have supported the Odyssey this year and throughout the decades. We have certainly had our ups and downs, but I am pleased to say we are definitely on an upward path. We had to say adieu to some of our favorite staff members, including Emily, Cal, Carlin, and Mark. We wish them well as they forge new adventures both near and far away. We are very fortunate to welcome a group of new and talented colleagues including, Jen, Rachel, Laure, Devin, and Elyse. Our amazing staff is working so hard and full of ideas about how to make the Odyssey even better. This year was the first full year that we were the home of the Mount Holyoke College Campus Store. It took some time to learn about the many variations of logo clothing, water bottles, pennants, decals, blankets, mugs, glassware, but we are now fully stocked— and always adding new items! Our website is busy with orders from alums and parents. Although this might not sound exciting to customers, I do want to share with you that we now have a new phone system and TWO new vacuum cleaners! The Odyssey traveled off-site even more this year. We were the bookseller at the Massachusetts School Librarian Association conference in Worcester, WRSI’s Meltdown in Northampton, PBS Kids in Springfield, and the Worcester launch for Jarrett Krosoczka’s National-Book-Award-nominated Hey, Kiddo. We also traveled up and down the valley bringing authors and illustrators to area schools. In addition to these off-site events, we also hosted a wide variety of authors at the store, including David Sedaris, John Kerry, Ottessa Moshfegh, Nancy MacLean, Andre Dubus III, Tommy Orange, Lauren Groff, Cristina Henriquez, Jennifer Zeynak Jonkhadar, Wayetu Moore, Holly Black, Cassandra Clare, Aaron Becker, Eva Paus, Amy Siskind, and Jane Yolen—to mention a few. Over the course of several months, we hosted Sister District postcard writing evenings which helped to elect Democrats in down ballot state legislature races. Jon Weissman and Deborah Levenson presented an evening on Single Payer or Medicare for All. And despite my father’s warning not to get involved in local politics, we hosted a meet and greet for the amazing Jo Comerford who in January will join other local women in the Massachusetts State Legislature! 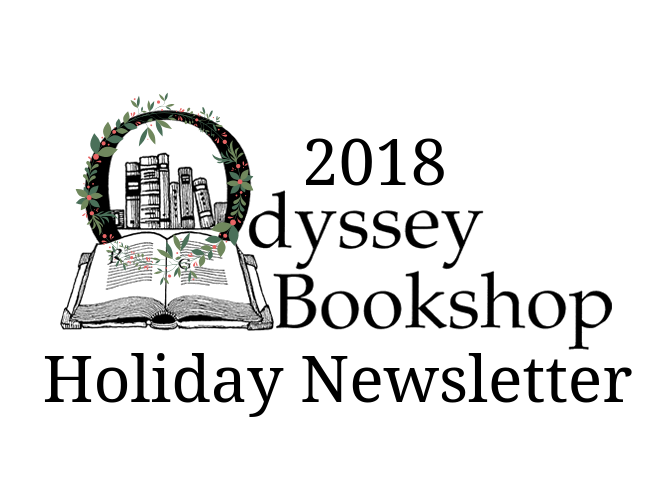 It was a hectic year for all of us at the Odyssey, and so we thank you for continuing to partner with us to bring readers and books together. Peace and good health to everyone. Our gift selection has expanded to include something for everybody, whether you're looking for something educational, playful, humorous, or just plain useful! Check out our expanded selection of board and card games, our French-milled soaps from Australia, or our hilarious socks from Blue-Q, which have become instant bestsellers! We also have jigsaw puzzles, puppets, and a variety of beautiful journals.